There are various skin problems, and sometimes they have similar symptoms and appearances, for example boil vs pimple. They both are bump on the skin with reddish color. Most people do not know the differences between boils and pimples. In this article, we are trying to give you information, so that later you can identify the differences between them and treat them in the right way. Boil is an infection on the skin because of bacterium called Staphylococcus aureus. The infection usually is located around hair follicle, and caused lump full with pus and dead tissue. Pimple, also known as zit or spot, is an inflammation on the skin because of clogging pores. Sebum which produced by sebaceous gland inside the pore are accumulated over the time and finally blocking the pore. This accumulated sebum is conducive to bacteria (Propionibacterium acnes) living and causing inflammation on the skin. Pimple is caused by clogging pore. Pore can be filled with sebum and dead skin cells which lure the bacteria to come in. More and more sebum and dead skin cells filling the pore make the pore finally clogged and trap bacteria inside the pore. Then bacteria cause infection and inflammation to the pore which lead to red swollen pore. Boil is caused by bacteria called Staphylococcus aureus which infiltrates hair follicle and causes infection and inflammation. These bacteria are relatively safe when it stays on skin’s surface. It can be dangerous when it penetrates the hair follicle through an open cut or open injury. The symptoms of pimple are various with different shapes, sizes, and types. Some pimples are filled with pus, and the others are not. Some pimples are hard lump, and the others are soft. Pimple is often happened on the face, but there are places besides the face where pimple can breakout, for example, chest, shoulders, back, and neck. Pimple can cause dark spot on the skin when it fades away. The symptoms of boil are the swollen areas with reddish color that can grow larger because of accumulating pus. Several boils can gather together creating a growth called carbuncle. A carbuncle can be very painful, and can leave an everlasting scar if it isn’t treated well. Individual with carbuncle may have symptoms like fatigue, fever, and chill. Boil is usually located in the areas like thighs, neck, armpits, and face. Hormone changes, for example, at puberty, menstruation period, pregnancy, when individual taking birth control or taking hormones injection especially male hormones. Particular medicines like barbiturate, steroids, or lithium. Particular foods such as dairy products, and carbs. Direct contact or using the same item with someone who has boil. Person with weak immune system. Though there are differences on risk factors between pimples and boils, people with pimple are prone to get boil too. In general, pimple can be treated with over-the-counter products which contain salicylic acid and benzoyl peroxide. Additional medicines such as antibiotic, birth control, and isotretinoin are given by doctor to eliminate the cause. There are also more advanced technologies such as laser therapy, chemical peels, and pimple extraction, which can be used to relieve pimple and its effects. You can do simple and natural treatment for relieving boil. Dab washcloth on the boil. This treatment allows the pus seeping out of bump, and as the result the boil will shrink. Cutting the boil is another way to drain the pus, but only professional doctor who can do that. You should take antibiotic after the treatment to prevent infection. Wash your face regularly at least twice a day to prevent sebum, dead skin cell, and bacteria clogging the pores. Don’t be over-wash your skin or it would produce more oil in order to compensate the dry skin because of over-washing. Use only oil-free skin care and cosmetic products, so that it won’t block the pores. Wash your hair regularly. Oily scalp and oily hair can cause pimple especially when oily hair constantly touch the face. Don’t use items that press the skin for long period such as helmet, headband, or scarf, because they can irritate the skin and cause inflammation. Don’t pick or pop the pimple, unless you want to get permanent scars. Refrain yourself from touching the face. Dirt and oil on your hand can transfer onto the face and contribute to breakouts. Boil is contagious, so don’t use the same items with anybody else, especially personal hygiene items such as towels or razor. By washing your hands with soap and warm water regularly, you can stop bacteria moving to your skin. If you have an open cut or open injury, clean it and cover it. That way bacteria won’t have a chance to infiltrate into the skin and cause boil. Don’t pick or pop the boil. That would increase the risk of spreading bacteria. Over-the-counter products, whether it is the cream or cleanser, is enough to treat and prevent pimples. Never touch, pick, and pop the pimple, so that it won’t leave the permanent scar on your skin. Go to your doctor to get more treatment if constant breakouts disturb you or make you have no confidence to yourself. Boil will slowly fade away in few days even though you don’t take any interventions or medicines. It’s because eventually the pus will drain out of the skin. Large boil may leave permanent scar. 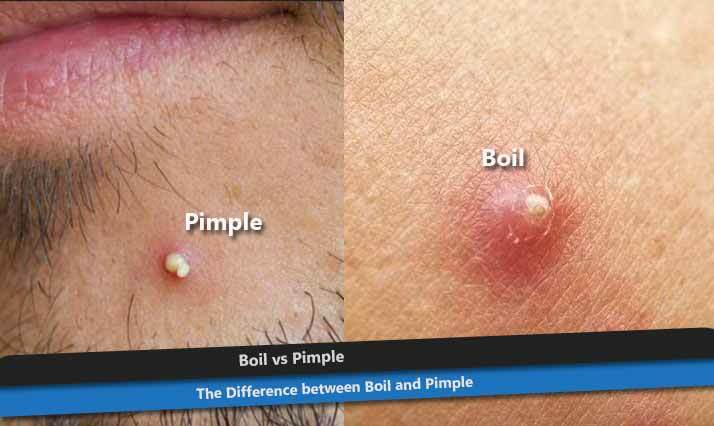 Those are the difference between boil and pimple.